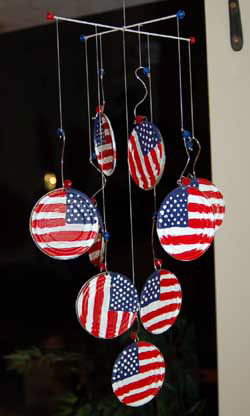 This unique patriotic mobile craft is one of many recycled crafts I have on the website, and is made from recycled materials. The discs are actually the lids from soup cans. This is a more complicated craft, which takes some time, mostly because of all the painting involved for this particular design. 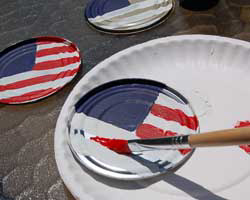 The effort is well worth it, because the end result is really beautiful, and it is a classy way to decorate for the Fourth of July. The circles can be decorated and painted in any design you choose. Pastel fabrics or patterned scrapbook paper covering the discs would be a nice way to create a mobile for a baby's room, for example. 1. 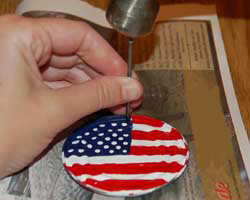 Begin the patriotic mobile craft by painting the soup can lids. 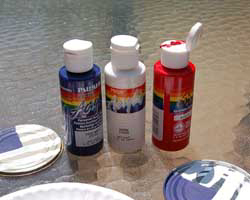 Using the red, white, and blue acrylic paints, paint each one to look like an American flag. Begin by painting one quarter of the circle blue. Paint the stars on just using dots, which can be done using the back of the paintbrush (just dip the back in white paint and dab on). Paint on red and white stripes. I found the my soup cans needed two coats, which took some time. You also want to make sure you paint both sides of the soup can lids. 2. Once the soup can lids are dry, give them a coat of clear protective sealing spray, and allow to dry. Then, take each lid and punch a hole near the top of each flag. You can do this using a hammer and nail. Put something underneath the soup can lid to protect your work surface. 3. Cut 9 pieces of the 18 gauge wire, each 5 inches long. Thread each piece of wire into the hole at the top of the flag. Add on a red bead. 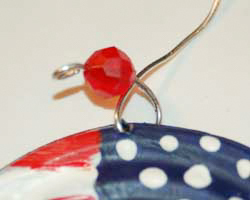 Using the needle nose pliers, make a tiny loop at the end of the wire to keep the bead from falling off. Then, make a curly decorative loop with the wire. See the photos below for help. 4. 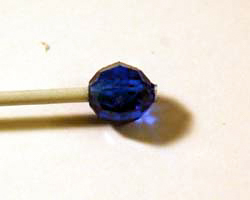 At the other end of the wire, thread on a blue bead. Make another tiny loop at the end of the wire to keep the bead from falling off. Then, bend the length of the wire in a decorative "S" shape. Again, refer to the photos below to see how I did it, or use your own creativity. 5. Continue adding wires to all 9 soup can lids, until they are all done. 6. 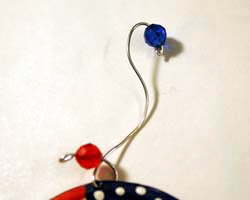 To make the top of the patriotic mobile craft, I used a white wire coat hanger. I cut the bottom straight part of the hanger off, and then cut this length of wire in half. Put the two wires together to form a cross, then use the thin wire (I used 32 gauge) to twist and wrap around the cross section to hold them together. You can also use a touch of super glue. 7. Add a bead to the end of each wire end, and secure with some super glue.bit. 8. 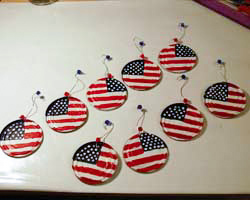 Now it is time to put the patriotic mobile craft together. 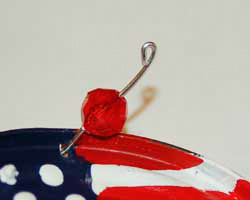 Tie a length of strong thread or fishing line around the top of each American flag, at the decorative wire loop. Attach this to the mobile top cross by tying the thread of four flags to the ends of each cross, near the decorative bead. Try to get them all the same length. I made these shorter. Tie four more flags, making them all the same length, but longer than the first four, to the middle section of each cross wire. Finally, the ninth flag can be the longest hanging from the mobile, and can be attached from the center of the mobile cross. 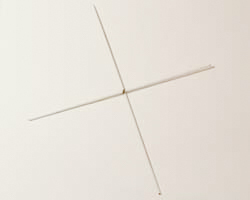 Add a thread to the top of the cross for hanging. To get the balance right, you can play with the placement of the threads along the length of the wire cross until it is balanced. 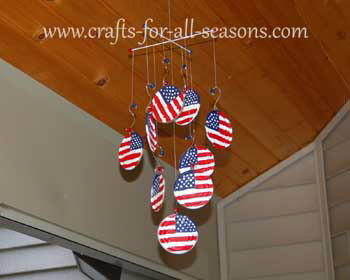 This patriotic mobile craft makes a beautiful and unique decoration for the summer. Enjoy!